A Book Review for You: A book review for How to Retire Happy: The 12 Most Important Decisions You Must Make Before You Retire 5 Out of 5 stars. A book review for How to Retire Happy: The 12 Most Important Decisions You Must Make Before You Retire 5 Out of 5 stars. The former Award-Winning Washington Post retirement columnist wrote about it, but knew nothing about prepping for his own retirement, which should remind all readers to always weigh what you read and don't always believe everything that you read. Learn from his mistake to avoid making your own. Mr. Hinden builds on that platform to write this book. It is a easy and fast read. Learn from his mistakes and avoid your own. He does a great job of waking readers to the reality of retirement. Retirement is more than just calling it quits. It is a process that requires a great deal of decisions to make, research and work to do it properly. It is also more expensive to do than you realize. 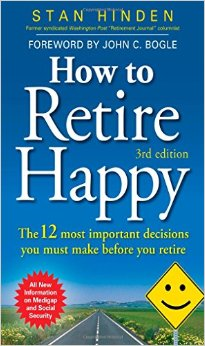 How to Retire Happy will help guide the reader to do just that. There is a lot of useful information in the book mixed with Hinden's mistakes and tips. If you're thinking about retirement, I recommend you giving this a read through. Chapters include and are aptly named by useful questions: Am I Ready to Retire? Can I Afford to Retire? When Should I apply for Social Security? How Should I take my pension payments? What Should I Do with the Money in my company savings plan? When Do I have to take money out of my IRA's? How Should I invest during retirement? What should I do about health insurance? What should I do to prepare for serious illness? Where do I want to live after I retire? How should I arrange my estate to save on taxes and avoid probate?